Pictured from left: Bridget & Dan McNally with son Danny McNally; Harrison Parrelli with parents Deb & Charles Parrelli; and Jennifer & Brian Perez with Connor Perez. Warwick Valley High School’s Connor Perez, Dan McNally and Harrison Parrelli were three of many Wildcats recognized with post-season honors. Connor Perez (22) caught 45 passes for 851 yards and 11 touchdowns (nearly 20 yard per catch average) and contributed 29 tackles, 4 interceptions and one INT for a TD. Perez earned ALL State Honors (Class AA), as well as Times Herald-Record, Coaches Association and Section IX Football Insider honors. Harrison Parrelli (5) lead all-Division II rushers with 1,161 yards on 188 carries (6.2 yards per carry), scoring 11 TDs. 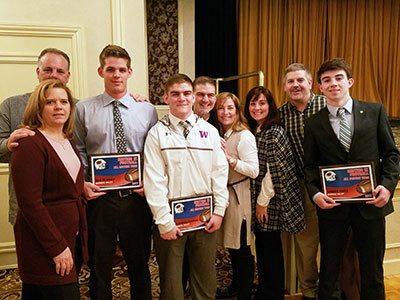 Parrelli was named to All-Section Coaches Association, Section IX Football Insider All Star and All-League. Dan McNally (55) led all Class AA defenders with 11.5 sacks and 17 Tackles for Loss, including 61 total tackles. McNally was selected All Section IX, Times Herald-Record 1st Team and Section IX Insider All-Star. He was also nominated to the Exceptional Senior Game. Honorable Mention All-League were Noah Daigle, Jason Hranitz, Andrew Wierzbicki and Kyle Rooney.